* These vintage Mariell bridal earrings glow with the brilliance of high-grade 6 ct.
* Cubic Zirconia cushion cut stones in an art deco inspired setting. * These popular bridal earrings measure 1 6/8" h x 3/4" w and are the epitome of classic bridal style. 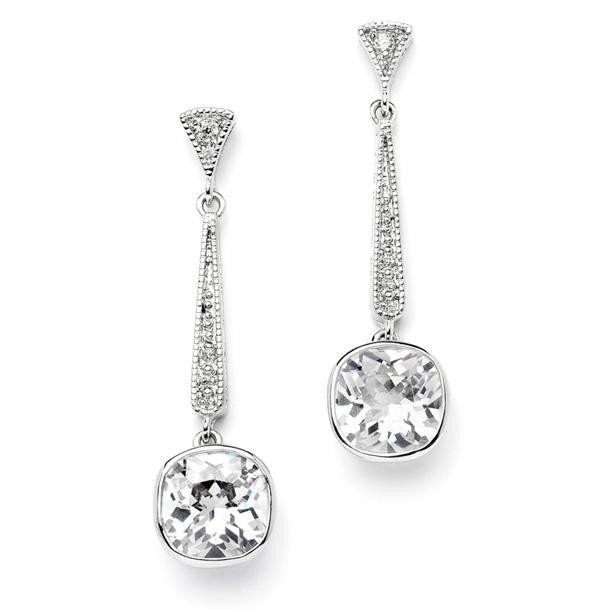 * These dazzling wholesale drop earrings by Mariell feature brilliant cushion cut Cubic Zirconia stones. * These beautiful CZ stones are set in a lustrous silver rhodium finish with filigree art deco tops adorned with a single CZ round inset gem. * These top-selling elegant bridal earrings have the rich look of diamond estate jewelry. * Enhance your store's wedding or special occasion jewelry display with these breathtaking earrings.